Welcome to NeoScandia, the most perfect, pretty and sanitised place you’ve ever seen. Though, it’s unlikely that you will be permitted in – and it’s very easy to be shown the way out. In Stohome, everything is clean and brightly lit, but across the bay in Helsingy City, everything is shabby. In its backstreets dwells homo felinus, human beings that have no place in Scandorama. The young Miscat is one of them; a genetic hybrid between a woman and a cat. 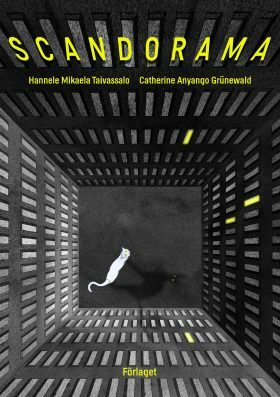 When Miscat goes undercover on a resistance mission, she finds herself irresistibly drawn to a certain golden boy who lives in an area of Scandorama that she will never be able to enter. The orderly-yet-xenophobic Scandorama is a Scandinavian dystopia – or utopia? – of an idyllic society, where humans are perfect and the borders are closed. Scandorama voices strong criticism of the prevailing social climate where those who lack identity documents are not entitled to exist. Scandorama is not only a depiction of a dystopian future, but also an important contemporary portrayal of how chaos arises from war, capitalism and alienation. Our thoughts are led back in time, to the age of racial biology, but also forward in time, to the Europe we might see ourselves living in if we continue to close our borders. If we continue to mistreat each other and the nature. Scandorama could be perceived as a warning letter. An artistic meeting that sparkles.